Roberts PolyPro releases its next-generation recyclable handle for can multipacks. CHARLOTTE, N.C., March 6, 2019 – Roberts PolyPro, a product brand of ProMach, announces its next-generation craft-beer can carriers are now available for order. A key new feature of the next-generation carriers is the ability to place customer branding or messaging directly on the carrier. Brewers can order custom tooling featuring their company logo or their product brands as well as custom colors or unique messaging to promote charity events, seasonal, and one-off brews. "Knowing that our brewers are producing their beers for a wide variety of occasions, we wanted to help them find another way to further customize their consumer packaging," said Chris Turner, Director of Sales. "With our new carrier design and customization options our customers will only be limited by their imagination." As with the first-generation Roberts PolyPro carriers, these next-generation carriers provide secure holding strength combined with an easy-release design that makes removing cans from the carrier simple and easy. These patent-pending carriers are available in four- and six-pack configurations with standard and custom colors for slim, sleek, standard, and 16-ounce cans. Holding strength is vital to handling performance in retail locations where multi-packs are often jostled from the case to the cooler to the shopping cart to the car and then home to the refrigerator. The carriers hold the cans securely until consumers are ready to enjoy them. When that time comes, Roberts PolyPro engineers made certain that the easy release design makes removing cans from the carrier hassle-free and easy. The easy release design features two small retention tabs that when pressed by the consumer smoothly release a can from the carrier. 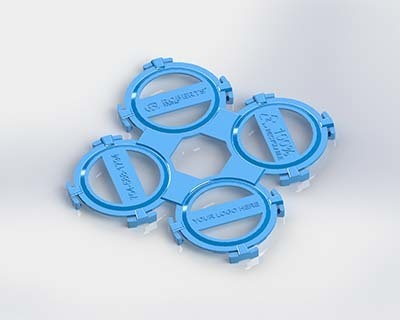 This eliminates the struggle of pulling a can from carriers that use a complete 360 degree plastic ring to hold the can. Inbound shipping efficiency for the next-generation can carriers has increased with carrier nesting and efficient tray packaging. Nested carriers will now be packed for shipment to brewers in trays rather than cases for a higher number of units per pallet and lower freight costs. All Roberts PolyPro carriers feature an open top design which promotes evaporation of condensation and minimizes the consumption of plastic, lowering carrier cost. Like the aluminum cans they are designed to hold, these carriers are 100 percent recyclable. The next-generation can carrier design is a direct result of Roberts PolyPro engineers collaborating with craft brewers. "We pride ourselves in proactively seeking customer input and listening to their pain points," said Turner. "This plays a big part in our product development process." The next-generation carriers are compatible with the full range of Roberts PolyPro applicators, from low-speed manual systems to automated high-speed can carrier applicators. Roberts PolyPro has equipment options for the smallest to the largest breweries. Stop by the Roberts PolyPro Booth #8129 at BrewExpo America 2019, Denver, Colo., April 8-11. Carrier samples and applicators will be at the booth as will sales personnel to answer questions and discuss solutions. Contact sales at 800-269-7409 and visit www.RobertsPolyPro.com.